Download "Security+ Guide to Network Security Fundamentals, Third Edition Chapter 9 Performing Vulnerability Assessments"
2 Risk: Likelihood of a threat agent exploiting a vulnerability Unrealistic assumption that all risks can be mitigated due to cost and time factors Some degree of risk must always be assumed Risk management Systematic and structured approach to managing the potential for loss that is related to a threat Risk Management Steps Step One: Determine the assets that need to be protected Asset identification Process of inventorying and managing these items Types of assets: Data Hardware Personnel Physical assets Software Risk Management Steps (cont.) Assets have attributes that need to be compiled Determine each item s relative value Valuation factors include: How critical is this asset to the goals of the organization? How difficult would it be to replace it? How much does it cost to protect it? How much revenue does it generate? 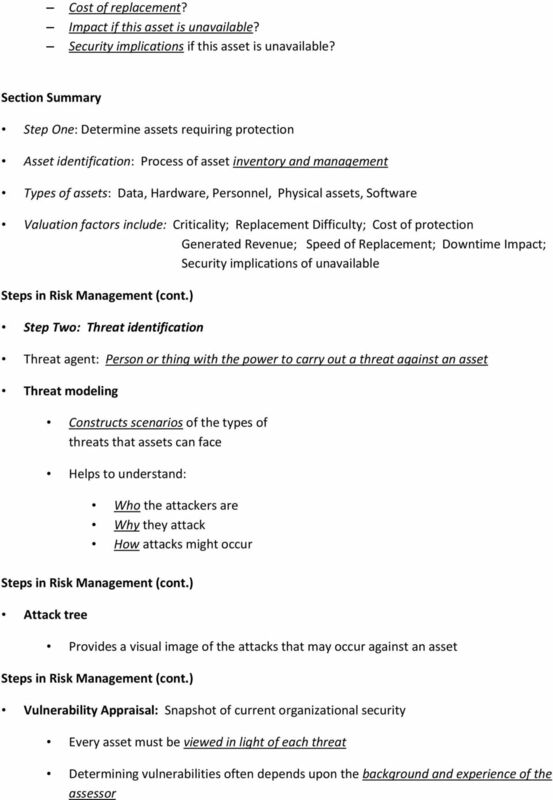 Risk Management Steps (Cont.) 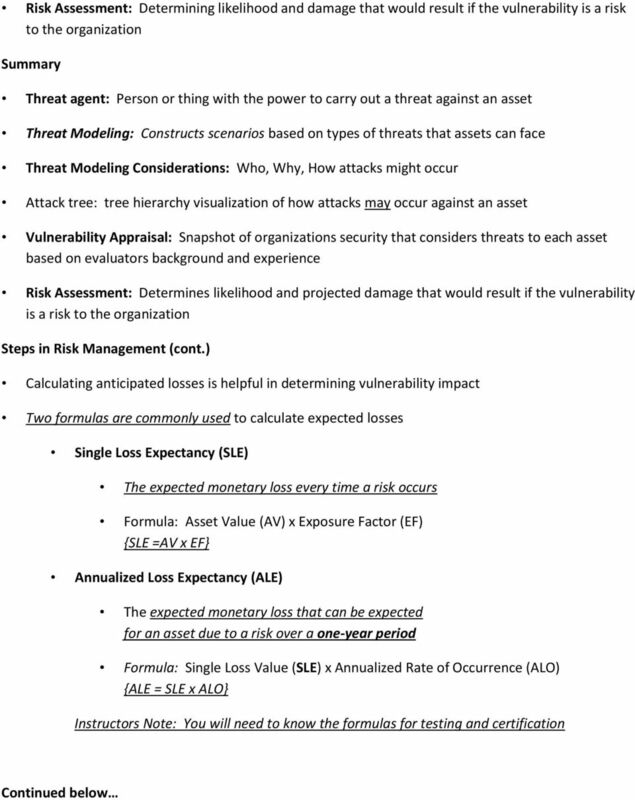 Steps in Risk Management (cont.) Valuation Factors (cont.) How quickly can it be replaced? 8 Password Cracker programs Use the file of hashed passwords and then attempts to break the hashed passwords offline The most common offline password cracker programs are based on dictionary attacks or rainbow tables Password Crackers (cont.) Shadow password Summary Optional implementation in UNIX and Linux systems Not Invoked: File containing hashed system passwords and user information visible to all users File stored in /etc/passwd Invoked: File can only be accessed at the highest level and contains only the hashed passwords File stored in /etc/shadow (Linux) or /etc/master.passwd (Unix) Two categories of software and hardware tools: Vulnerability scanning and Penetration testing Vulnerability scanning: Used to identify weaknesses in the system Vulnerability Tools: Port Scanners; Network Mappers; Protocol analyzers; Password crackers; Vulnerability scanners Port Scanner: Uses a combination of IP address responses to specified port probes to determine services the system is actively listening 3 Port Scan responses options: Open; Closed; Blocked 3 Ports classifications: Well-Known, Registered, & Private numbers Network Mapper: Use ICMP and other techniques to illicit a response from a network endpoint. 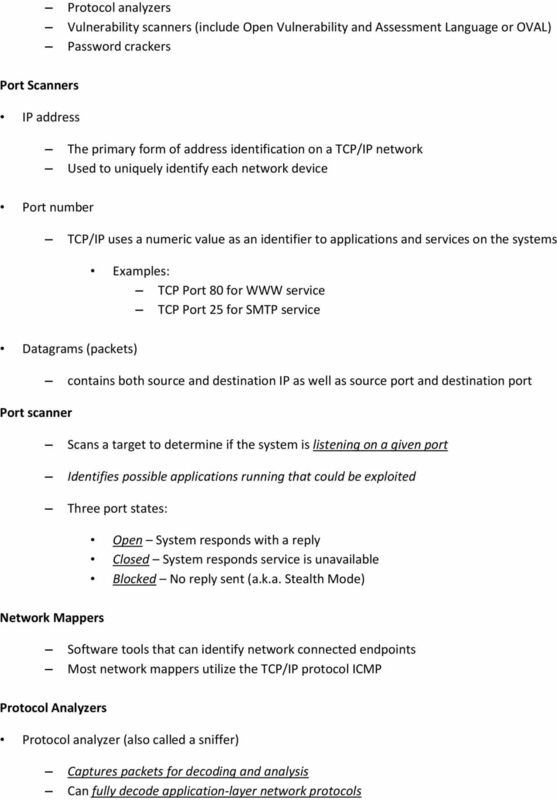 Protocol Analyzer: Capture and decode application layer packets for use in trouble shooting, traffic characterization, and security analysis Open Vulnerability and Assessment Language (OVAL): International standards-based data exchange format that provides interoperability between security implementations and is support on all major OS categories. Network Scanning. What is a Network scanner? Why are scanners needed? How do scanners do? Which scanner does the market provide? For more information on SQL injection, please refer to the Visa Data Security Alert, SQL Injection Attacks, available at www.visa. locuz.com Professional Services Security Audit Services Today s Security Landscape Today, over 80% of attacks against a company s network come at the Application Layer not the Network or System layer. Security Threat Kill Chain What log data would you need to identify an APT and perform forensic analysis? information security and its Describe what drives the need for information security. Computer Information Systems (Forensics Classes) Objectives for Course Challenges CIS 200 Intro to Info Security: Includes managerial and Describe information security and its critical role in business. VOIP Attacks On The Rise Voice over IP (VoIP) infrastructure has become more susceptible to cyber-attack due to the proliferation of both its use and the tools that can be used for malicious purposes. Review: McAfee Vulnerability Manager S3KUR3, Inc. Communicating Complex Concepts in Simple Terms Tony Bradley, CISSP, Microsoft MVP September 2010 Threats and vulnerabilities are a way of life for IT admins. The purpose of this report is to educate our prospective clients about capabilities of Hackers Locked. MCSA Security + Certification Program 12 credit hours 270 hours to complete certifications Tuition: $4500 Information technology positions are high-demand occupations that support virtually all industries.